We left LA at 10 on the biggest freeway I have ever seen, and stopped at Denny’s (a fast food franchise) for a late breakfast. The portions are still so huge in the US that W and I have to split every meal. The closest thing to eggs Benedict that Denny’s can offer is eggs cooked inside an o-shaped dough, hash browns (adapted from the swiss rosti, and I bet they thought they invented it) with bacon so crisp it’s easier to eat with my fingers. The coffee is bottomless, but America is not renowned for it s coffee – even Starbucks is looking good here! It’s good that this is a bottomless cup; I have to drink a gallon of it to equal a regular shot of caffeine in Sydney. 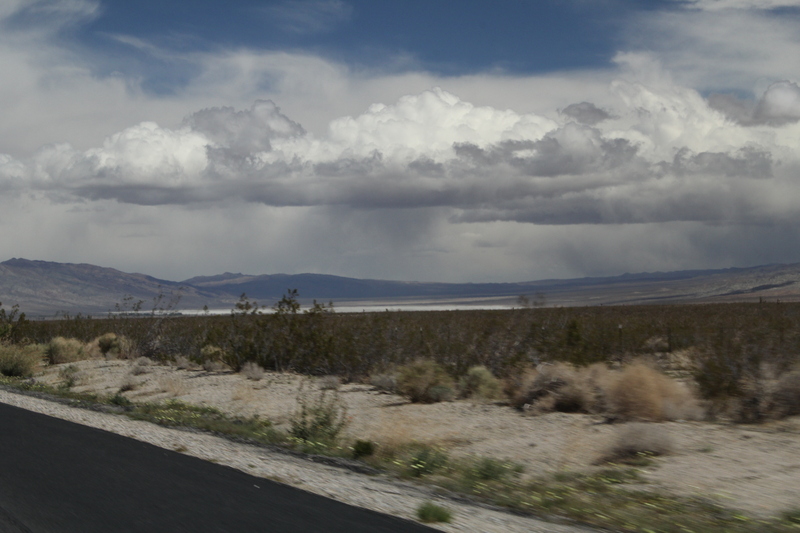 Our trip soon takes us into back country – Death Valley is a good 5 hour drive from LA on excellent dual lane highways. 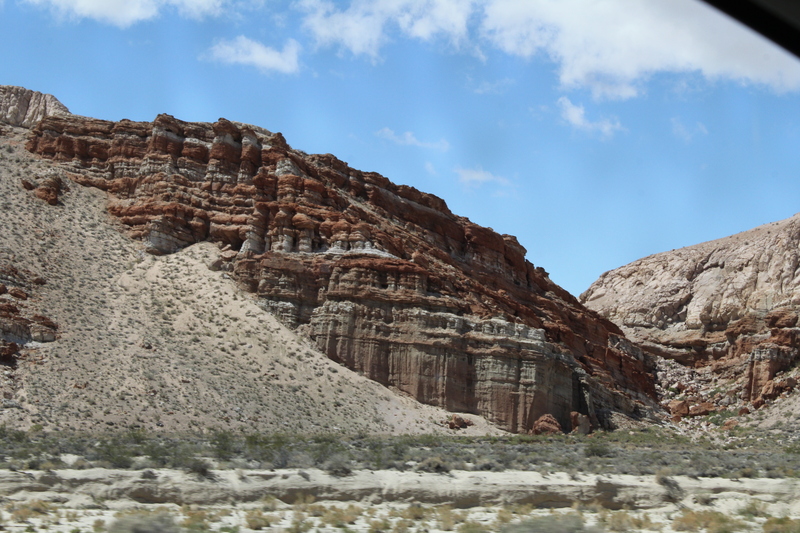 Very quickly the landscape turns to desert; sandy, rocky and very sparsely vegetated. The speed limit is in miles per hour, but the VW has the speedo in both miles and kilometers, so we always know how fast we are going. Most of the drive the limit is 65mph, though like Sydney, the unofficial limit seems to be 5mph above the official one. We are a little perplexed as we get further out; signs proclaim ‘speed limits enforced by airplane’!! There is an air force base nearby, so maybe in their time out from Afghanistan the pilots moonlight on traffic patrol. Any minute now, W and I expect a jet or helicopter to swoop down onto the highway in front of us and issue us with an infringement. I could almost hope for that to happen! The closest we get is a jet fighter that practices rolls and loops in the sky above, but he doesn’t seem to be interested in us. We finally arrive at the aptly named Furnace Creek Ranch at about three, the temperature is a mild 19 deg c – a long way from the 56.5 deg C maximum temperature ever recorded. The country here is characterised by mountainous ranges rising up to 1000m, separated by valleys strewn with stones, salt pans and sand. The mountains appear painted; myriads of colours from chocolate brown through to russet reds, pale pinks, cream, yellow and even turquoise. It is hard to imagine the early pioneers making their way across this barren landscape in wagons drawn by oxen or mules. Even on horseback it would be difficult – no way I would be galloping Danny across here! No such problem for us – the road is as smooth as a baby’s bum and almost as new. We cross two ranges of mountains to get to Death Valley, and there is a third range in front of us if we want to carry on to Las Vegas. This is the reason it is Death Valley. The Sierra Nevada, Argus, Inyo and Panamint mountain ranges all lie to the west and effectively block any rainfall from the coast. The valley lies 100 feet below sea level, and what used to be a flat sea bed now only holds saline water 30x saltier than the sea. Most amazingly there is a type of shell-less snail that thrives in this water eating algae! Nature is so cool. 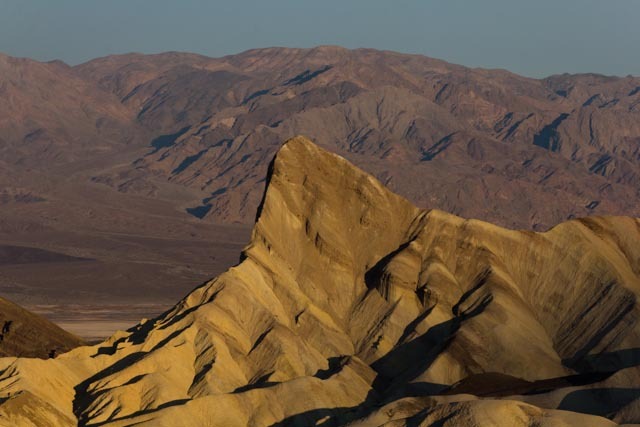 Our first sunset is observed from Zabriskie point, a favourite with photographers. This sunset is not overly photogenic due to large cloud banks that cover the skies. On a scale of 1 -upstairs 10 I’d rate it 6. 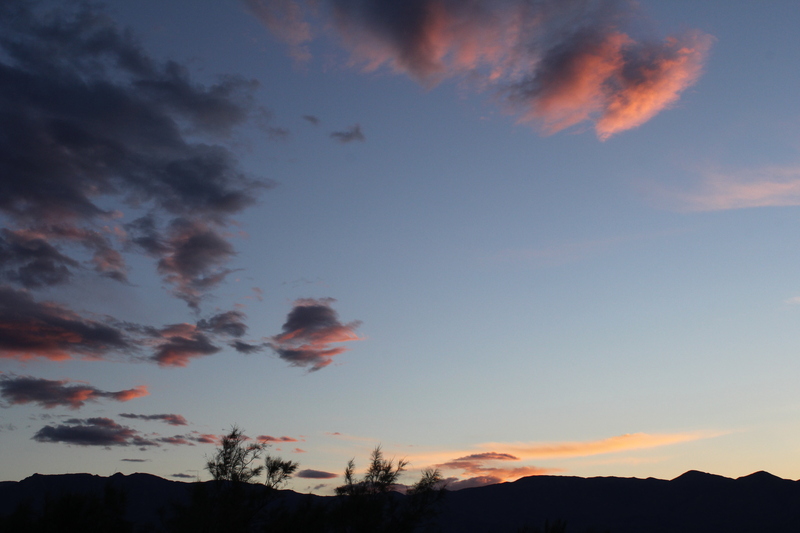 We adjourn to the terrace of the Furnace Creek Inn, the more up-market sister to the ranch where we are staying, and enjoy the rest of the pastels that appear in the skies. A prickly pear margarita and a dry martini and the sunset looks great!